Center Harbor is a town located in Belknap County, New Hampshire, United States. As of the 2010 census, the town had a total population of 1,096, a number which multiplies severalfold during the summer months. 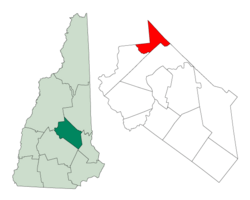 It is situated between Lake Winnipesaukee and Squam Lake. Center Harbor separated from the town of New Hampton, and was first incorporated in 1797. 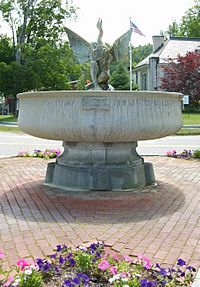 The town gets its name from two sources: from its location, centered between Meredith and Moultonborough harbors, and also from the Senter family, who were owners of a large amount of property in the area. 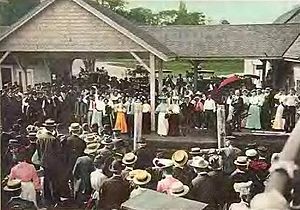 The town was a landing place for lake steamers and stagecoaches, making it a popular summer resort. 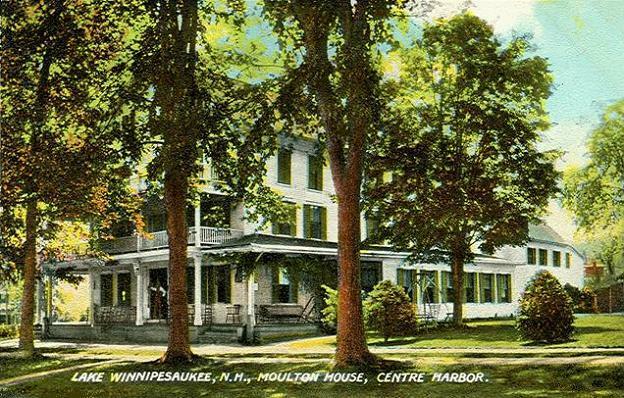 Center Harbor was a favorite spot of John Greenleaf Whittier, and the home of Dudley Leavitt, author of the first Farmers' Almanac in 1797. Center Harbor is the winter home of the paddle steamer MS Mount Washington, the largest boat on Lake Winnipesaukee. According to the United States Census Bureau, the town has a total area of 16.5 square miles (42.8 km2). 13.4 sq mi (34.6 km2) of it is land, and 3.2 sq mi (8.2 km2) of it is water, comprising 19.21% of the town. It has several miles of shoreline on Squam Lake and another mile on Lake Winnipesaukee, where its main "harbor" lies. The town center sits eccentrically near Center Harbor's northeast border, where it rises gently from the shore at the junction of New Hampshire Routes 25 and 25B. The highest point in town, Sunset Hill, elevation 1,121 feet (342 m) above sea level, overlooks the town center from the west. Center Harbor lies fully within the Merrimack River watershed. NH 25 passes through the eastern edge of town, including the town center, connecting Meredith to the south with Moultonborough to the northeast. U.S. Route 3 and NH 25 pass north-south through the western part of town, connecting Meredith to the south with Holderness to the northwest. NH 25B leads from the town center west to US 3 and NH 25, forming a short-cut for through-travelers on NH 25. The Proctor Wildlife Sanctuary, owned by the Audubon Society of New Hampshire, occupies 47 acres (19 ha) of woodlands northwest of the town center. Adjacent to this property is Center Harbor Woods, a 225 acres (91 ha) conservation area owned by the Lakes Region Conservation Trust and protected by a conservation easement held by the Squam Lakes Conservation Society and the town of Center Harbor. The two properties abut a third conservation property in neighboring Moultonborough, resulting in a block of protected woodland comprising nearly 400 acres (160 ha). As of the census of 2000, there were 996 people, 414 households, and 293 families residing in the town. The population density is 74.4 people per square mile (28.7/km²). There are 653 housing units at an average density of 48.8 per square mile (18.8/km²). The racial makeup of the town is 98.80% White, 1.00% Hispanic or Latino and 0.80% Asian. There are 414 households out of which 28.5% have children under the age of 18 living with them, 57.7% are married couples living together, 9.4% have a female householder with no husband present, and 29.2% are non-families. 22.0% of all households are made up of individuals and 9.4% have someone living alone who is 65 years of age or older. The average household size is 2.38 and the average family size is 2.75. In the town, the population is spread out with 21.5% under the age of 18, 5.2% from 18 to 24, 24.0% from 25 to 44, 31.9% from 45 to 64, and 17.4% who are 65 years of age or older. The median age is 45 years. For every 100 females there are 100.4 males. For every 100 females age 18 and over, there are 101.0 males. The median income for a household in the town is $51,806, and the median income for a family is $55,938. Males have a median income of $35,526 versus $24,231 for females. The per capita income for the town is $25,627. 6.7% of the population and 4.4% of families are below the poverty line. Out of the total population, 13.4% of those under the age of 18 and 5.6% of those 65 and older are living below the poverty line. Center Harbor hosts a Fourth of July celebration featuring a road race (including a children's race around the library), parade, band concert, and fireworks over the lake. The Center Harbor Town Band, founded in 1878, offers free concerts on Fridays in the summer. In the winter, the town is a stop for snowmobile enthusiasts. Center Harbor, New Hampshire Facts for Kids. Kiddle Encyclopedia.